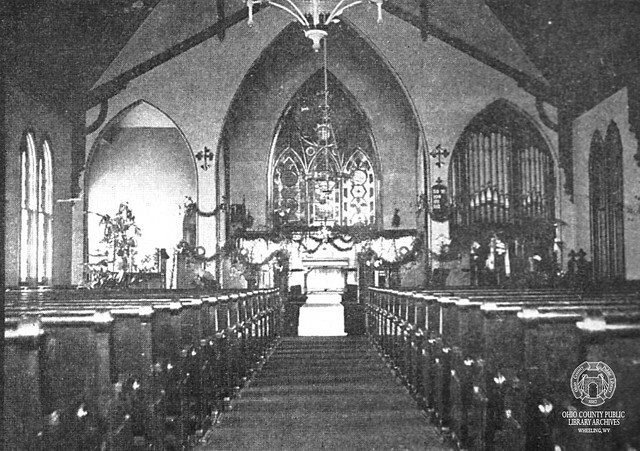 St. Luke's Episcopal Church on Wheeling Island was dedicated by the Right Rev. George W. Peterkin, D.D., Bishop of the Diocese of West Virginia, June 10, 1883. ▶ A history and record of the Protestant Episcopal Church in the Diocese of West Virginia : and, before the formation of the diocese in 1878, in the territory now known as the state of West Virginia, Peterkin, Geo. W., 1902. Wheeling Room, non-circulating, ask for access at the reference desk. ▶ Vertical File: Wheeling Episcopal Churches, Wheeling Room, non-circulating, ask for access at the reference desk. ▶ Archives Vertical File: St. Luke's Espicopal Church, Archives and Special Collections, non-circulating, view by appointment only. Please call 304-232-0244 to make an appointment to view this collection or use the Ask a Librarian form.